We will draw the winner in one week. “Young people are defecting from the faith at an historic rate. Over the following pages, we’ll meet dozens of young people who have wandered from God. They are part of what researchers call Generation Y or the Millennials, the name given to those born after 1980. Some are slightly older…born in the late 1970s” (p. 11-12). He goes onto write that, “No two leavers are identical, but upon close observation some categories emerge. We will meet six kinds of leavers and look at practical ways to connect with each type” (ibid). 1. “there is a different ‘truth’ for each person. And experience-not rationality-is the key to finding that truth” (p. 27). Claims of absolute truth are even viewed as arrogant and dangerous. 2. Deconstructionism is used in every area of life. Deconstructionism originally applied to the interpretation of literary texts. “To deconstruct a literary text is to expose its contradictions and oppositions, to demonstrate that it can ultimately have no fixed meaning” (p. 28). 3. Concern for the marginalized. The postmodernist finds that metanarratives frequently ignore this group. In order to reach postmodern leavers , Dyck suggests that the follower of Christ provide them with the story of their personal relationship with Jesus due to the reluctance towards metanarratives. However, because of the “true for you” mentality they have, the metanarrative of the Gospel must be eventually conveyed. “...aim to convey the gospel story in creative and beautiful ways. Retell stories that show Jesus’ heart for the marginalized, such as His exchange with the woman at the well…Leavers already know the basic gospel outline. But as I interviewed them about their impressions of Christian faith, I started to see that what many of them had in mind was a distortion, a faded image of the vivid Messiah encountered on the pages of Scripture. They desperately need passionate storytellers willing to re-enchant the gospel story, and let the person of Jesus capture their imaginations afresh” (p. 38). The author goes on to ask Christians to truly love and accept postmodernists wherever they stand spiritually, to build a relationship with them and to ask them to take part in service projects with Christians in order to reach them. “He [Jesus] earned people’s trust through service and sacrifice. He invited people to serve alongside Him. He preferred colorful stories over linear arguments, to sketch a compelling picture of God’s radical, beautiful kingdom. We’d do well to surrender our often clunky and predictable methods to follow Him” (p. 40-41). This beginning section made this reader evaluate how vibrant and exciting my faith looks to those on the outside and again reiterated that Christian apologetics should be an avenue to build friendships, not just defeat opponents. This category of leavers arises from either the failings of “godly” people towards them, which causes them to make God guilty by association, or perceived failings of God towards them. “They have often experienced some form of abuse in the name of God. A Sunday school teacher verbally hurt them. An elder molested them. Perhaps the abuse was even perpetrated by a member of their own family…Of course not every recoiler has undergone dramatic physical or verbal abuse. ..There’s no shortage of garden-variety human failings that sour people on the faith” (p. 58). “There are those who feel directly hurt or disappointed by God. They hold God responsible for experiences as disparate as extended spiritual dryness to misfortune in life” (p. 59). The recoiler may even back up and mask these emotional reasons for leaving the faith with intellectual ones. “We have rich truths to offer the recoilers in our lives. The Bible is a deep well for the abused and broken. And the God it reveals is not some distant deity, standing aloof from His creation. Instead He chose to delve into the mess of humanity, knowing it would break His heart. As a result we have a high priest who is ‘touched by our afflictions,’ a divine sufferer to accompany us in our darkest hours. To all who suffer we can point to His cross, a bold promise that even the worst injustices can ultimately lead to redemption” (p. 67). “...love linear thinking, objective truth, and the Western tradition of rational thought. ..most of them feel Christian faith is too concerned for the marginalized, a dangerous naiveté in a Darwinian, survival-of-the-fittest world” (p. 74). Modernists also believe that truth is found through scientific investigation and reason and not revelation. If something cannot be proven naturally and empirically it is not truth. Typically modernist leavers arise because they were seeking answers from Christians and were either not getting any or getting insufficient ones. When a Christian engages with modernist thinkers, Dyck finds it important to first ask probing questions that will uncover their worldview and why they hold to that worldview. Once the worldviews are on the table then traditional apologetics can be conducted. Each person must defend their worldview. Because modernists love to debate, he also instructs the Christian apologist to keep the focus on “the life-giving power of the gospel” (p. 96). Discussions with them can easily shoot off into tangents on issues that are not crucial in the defense of Christianity. Dyck writes that the number of Wiccans in the United States doubles approximately every thirty months and is therefore the fastest growing religion in the nation if not the world. Although Wiccans may claim it to be so, Wicca is not an ancient religion. It was founded by Gerald Gardner in the mid-twentieth century. “Wicca, derived from the word witchcraft, is a neo-pagan, earth-based religion. Wiccans worship a goddess and a god, practice magic, worship nature, and engage in seasonal rituals. They believe in a unifying energy present in nature that can be manipulated through magic to bring personal rewards such as love, financial blessing, and general happiness. Though Wiccans worship gods, their conception of the divine is radically different from the Christian understanding. They deny a transcendent deity; the goddess and god are merely manifestations of nature’s energy. Furthermore, Wiccans regard themselves as divine, and freely refer to themselves as gods or goddesses as well. One common Christian misperception is that Wiccans claim to worship the devil. Wiccans have no belief in the Christian God, or the biblical Satan” (p. 110-111). Dyck goes on to state that, beyond this, Wicca is difficult to define because it has no central authority and adherents can pick and choose which beliefs and practices they accept. He also writes that, even though Wicca places itself in opposition to mainstream culture, it has benefited greatly from it. Feminism, consumerism, and the environmental movement have contributed to its growth. Recalling his time attending college in Portland, Oregon, where earth-based spirituality abounds, Dyck writes that in certain classes, “It [Christianity] was derided because it was not earth-centered, it taught that humanity was the crown of creation, and it revealed a God both immanent and transcendent” (p. 118). He notes that since he graduated he has encountered these thoughts about Christianity in multiple cities and usually among the younger generation. He goes onto discuss that neo-pagans have the strongest aversion to the Christian faith of all leavers. This is due to Christians commonly misrepresenting their beliefs by calling them Satan worshipers, animal sacrificers and even baby murderers. When the follower of Jesus interacts with neo-pagans it is important to demonstrate that their basic beliefs are known and to ask them questions about what attracted them to Wicca. This will make them much more open to listen. Also, what exactly they believe and the problems they have with Christianity will be discovered. “...in our age of wanton environmental degradation, creation care is vitally important, and completely consistent with Christian principles. It’s also essential to our witness, especially to neo-pagans…Reaching neo-pagans begins with showing an appreciation for nature and a desire to protect it, all while directing them to the God of whom nature is a grand reflection” (p. 122, 123). In order to reach the neo-pagan, Dyck also recommends pointing to women in ministry and what the Christ follower’s church offers to foster the spiritual growth of women. Ultimately, provide the neo-pagan with the example of Jesus and his affirming actions towards women. Dyck says to not be shy about sharing spiritual experiences with them. He writes that “they are usually the kind of people who prize experience over theory; and who embrace spiritual truth with their hearts before they’ll accept it with their minds” (p. 125). And finally, above all, pray! Interacting with neo-pagans is a spiritual battle at its core and the power of God is needed to bind any spiritual powers that may be blocking them from returning to Him. This reviewer enjoyed this section because it does an excellent job of familiarizing the reader with Wicca and explaining how to best connect with those who practice it. There two sub-categories of leavers under this category. The first, Dyck calls the “moral rebel.” These leave the faith simply to indulge in sinful desires. It is not any more complicated than that. The second type of rebel is what Dyck has given the name, “spiritual rebel.” They rebel because, “Submitting to an all-powerful deity is an idea they find intolerable” (p. 141). Later Dyck writes that, “Deep down they may believe, but they’re too proud to bow. Where God extends a loving hand, they raise defiant fists” (p. 143). While these are simple and straightforward reasons for leaving Christianity in the dust, they are some of the hardest to conquer and get people to come back and pick Christianity up again. In this section, Dyck briefly talks about how in the 1980s the church dived headlong into the idea of using business practices. Youth programs were especially impacted as the emphasis went from discipleship to attracting large numbers of teens and keeping them entertained. The church made the gospel boring. There was no risk, no sacrifice, no adventure, and no purpose involved and that is what lies underneath the behavior of moral rebels. “Somehow we thought we could water down the message for young people and make it easier for them to swallow, but it turns out that they’re choking on our concoction. They don’t want cute slogans and serenity. They don’t want pizza and video games. They want revolution and dynamism. They want unvarnished truth. They want a cause to live and die for. In other words, they want the true gospel. When we present that gospel, with all its hard demands and radical implications, we’ll finally be speaking the language moral rebels long to hear” (p. 149-150). The author also instructs to watch for “moments of heightened receptivity” in the moral rebel’s life. These are times in a person’s life when crisis or turmoil increases their spiritual openness. And the lifestyle of a moral rebel usually leads to these moments. If the Christian watches for these moments and is tuned in with the leading of the Holy Spirit, many opportunities will arise to meaningfully converse with moral rebels. As for relating with spiritual rebels, Dyck highlights the importance of prayer. He does note that prayer is important in reaching any kind of leaver, but especially with the spiritual rebel. Prayer that God would soften their hearts. He also says that the Christian can point out to them that everyone bows to someone or something. The Christian must also model the freedom that comes from serving God. “...we must model this subversive freedom. I’m convinced that our most powerful witness to them will not come through our words. Rather we will make the greatest impact as we live out a dynamic Christian freedom in their midst. Next to the freedom of those bound by Christ, all other freedoms ring hollow” (p. 153). Dyck states that by looking at these beliefs, ways in which drifters can be reached are revealed. First, when drifters see the follower of Jesus loving Jesus because He is Jesus and not because of anything He can give them it exposes their counterfeit faith. It is also important to invite them into atmospheres in which they will be around other Christians and hear the gospel. And it must be the true gospel with all of its hard demands and full out commitment. Finally, the inviter of the drifter must seek to broaden the circle of their Christian friends. Dyck finds this important because of the drifter’s inclination to isolate themselves. Dyck also discusses in this section the tendency of humans to drift from God. It is because of this tendency that Dyck finds Christians to be the biggest threat to Christianity. He writes that, but for the mercy of God to bring him back and refresh his love for God, he would be in the same place as the many leavers he has been discussing. 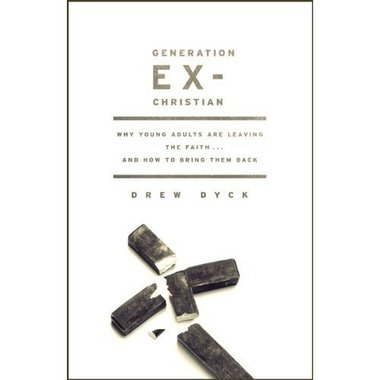 Generation Ex-Christian gives the follower of Jesus a thorough look into why people are leaving the faith. Practical advice, such as modeling a concern for truth and not assuming leavers know the Bible and Christian doctrine when engaging in apologetics, is scattered throughout the book as well. The best feature Dyck added to this book was the “Portraits” at the end of each section. These passages leave the reader knowing that the book is not about categories or triumphing over enemies. It is about people, souls lost and headed for hell and Jesus who is calling them back to Him. I walk away from this book with a greater mindset in my apologetics to: listen to and understand people; build relationships on love and truth; and pray for those I engage with because what I say and do is not the determining factor in what will draw people to Christ. It is Christ Himself. CNN recently featured an article about the so-called "Reason Rally" that took place today in Washington D.C. and referred to American Atheist president David Silverman as "American's Top Atheist Agitator." Interestingly, like one of atheism's heroes, Richard Dawkins, the "top atheist agitator" doesn't seem to interested in the free exchange of ideas. Check out Wintery Knight's excellent post and see for yourself here. In this featured video, Dr. William Lane Craig lays out the historical and Biblical evidence for Jesus' resurrection from the dead. An audience Q & A follows the main talk. This talk was part of Dr. Craig's UK Reasonable Faith Tour in October 2011 and was filmed in Southampton Civic Hall. It was sponsored by the Damaris Trust, UCCF and Premier Christian Radio. More resources from Dr. Craig can be found here. Striving to Hear Arguments with "Fresh Ears"
As I continue to consider the arguments for and against the existence of God, I am reminded of the importance of forcing oneself to hear these arguments with "fresh ears." Allow me to explain. As someone who continually weighs and considers the truth of Christianity, I confess that sometimes it easy to fall into the trap of dismissing an argument simply because I have heard it before. For example, when considering the teleological argument for God's existence, it seems that one can almost guarantee that the challenge of the multi-verse will arise. As someone who finds this argument to be utterly unconvincing, it can be tempting to simply think, "Oh, here we go again." However, lately I have been reminded that if my ultimate goal is discover that which is true, I must be willing to hear arguments with "fresh ears" and be willing to challenge my own presuppositions; even if I've heard these arguments time and time again. If what I believe is really true [which I obviously feel it is or I wouldn't believe it!] then continually critiquing it and questioning it can only strengthen my convictions. Moreover, it is not only important for the Christian to strive to hear arguments with "fresh ears;" but no matter what one's worldview is, they should strive to challenge their presuppositions as much as possible and follow the evidence wherever it leads. In the same way I admit that I sometimes fall into the "here we go again" trap, the atheist can also fall into the trap of dogmatically holding to their position while not really considering the arguments that challenge their beliefs...or "lack of belief." That being said, it should also be noted that some arguments are much more worthy of consideration than others. Consider the argument that Jesus never existed. I feel that the evidence for His existence is so persuasive that to convince me otherwise would be very difficult indeed. I'm simply not going to spend much time on such an argument; however, this is due to the fact that the positive evidence is so strong that it's negation would be absurd. In conclusion, I would encourage you, regardless of your worldview, to join me in hearing the arguments for and against opposing worldviews with "fresh ears." If it is truth you seek, then this seems to be the only rational thing to do. "For the wrath of God is revealed from heaven against all ungodiness and unrighteousness of men, who by their unrighteousness suppress the truth. For what can be know about God is plain to them, because God has shown it to them. For his invisible attributes, namely, his eternal power and divine nature, have been clearly perceived, ever since the creation of the world, in the things that have been made. So they are without excuse. For although they knew God, they did not honor him as God or give thanks to him, but they became futile in their thinking, and their foolish hearts were darkened. Claiming to be wise, they became fools, and exchanged the glory of the immortal God for images resembling mortal man and birds and animals and reptiles.